Pozidriv is a type of screw head and screwdriver jointly patented by the Phillips Screw Company and American Screw Company. The name is thought to be an abbreviation of positive drive. It is similar in appearance to the classic Phillips cross-head, but in fact is substantially different. The largest advantage it offers is that, when used with the correct tooling in good condition, it does not cam out, allowing greater torque to be applied. 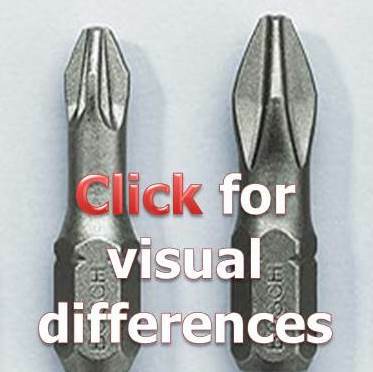 The differences lie in the way that the drivers are machined, the Phillips driver has four simple slots cut out of it, whereas in the case of the Pozidriv, each slot is the result of two machining processes at right angles. The result of this is that the arms of the cross are parallel-sided in the case of Pozidriv, and tapered in the case of Phillips. The pozidriv has four additional points of contact and does not have the rounded corners that the Phillips screw drive has. The pozidriv screw can be distinguished by a line embossed in the screw head at 45 degrees to the slots for the driver. If the driver slots are at 0, 90, 180 and 270 degrees, the marker lines are at 45, 135, 225 and 315 degrees. The Phillips Screw Company was founded in Oregon in 1933 by a travelling salesman, Henry F. Phillips, who bought the design from J. P. Thompson. Phillips was unable to manufacture the design, so he leased the patent to the American Screw Company, who were the first to manufacture it. It was first used by General Motors in the 1936 Cadillac, and within three years most screw makers produced Phillips head screws under license from Phillips screw. The Pozidriv® was developed by Phillips to give improved engagement and driver grip to that available from the Phillips® drive. GKN in the UK subsequently developed the Pozidriv into the Supadriv® to provide even more driver engagement, Supadriv® did not, become widely accepted in the market.